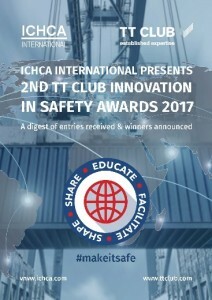 15.02.2018 – Presented at ICHCA’s 65th anniversary conference last year, the 2nd TT Club Innovation in Safety Award aimed to highlight the importance of safety at a time of increased operational demands on the cargo handling infrastructure and operations worldwide. The Award, open to any individual or organisation involved in cargo logistics around the world, required entrants to show that a product, idea, solution, process, scheme or other innovation had resulted in a demonstrable improvement to safety. The range of entries displayed both a great diversity of safety issues, as well as tremendous passion, effort and ingenuity. The digest published today provides in-depth details of each safety improvement that was submitted for the 2017 Award, of course including the winning entry, Hapag Lloyd’s Cargo Patrol. This is an industry-leading attempt to reduce fraudulent cargo declarations that obscure the true identity of dangerous goods transported around the globe. Also included is an explanation of Safety Ammo, awarded the 2017 ‘Highly Commended’ prize. An RFID-based safety solution, developed with DP World Brisbane, this minimises the dangers faced by workers who physically handle twistlocks on the underside of containers on the waterfront. The full digest, including details of all entries submitted, is available to download for free here. Established in 1952, ICHCA International is an independent, not-for-profit organisation dedicated to improving the safety, productivity and efficiency of cargo handling and movement worldwide. ICHCA’s privileged NGO status enables it to represent its members, and the cargo handling industry at large, in front of national and international agencies and regulatory bodies, while its Technical Panel provides best practice advice and develops publications on a range of practical cargo handling issues.